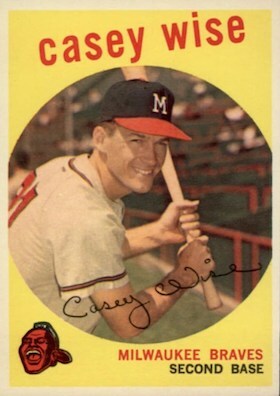 When the 1959 Milwaukee Braves shuffled eight second basemen in a game of musical gloves, Casey Wise was Mr. June. Wise was born into a baseball family, but his big league career was short and disappointing. His baseball earnings paid his way through dental school, launching a successful second career. Hughie moved his family to Hollywood, Florida, in the 1930s, where he developed a sideline business designing ballfields for minor league and spring training use. His older son, Hugh Jr., signed with the Braves and played four years in their farm system as an outfielder. The younger, Kendall, became an all-around sports star at South Broward High. He set a state record in the pole vault (11 feet, 6 inches) and was all-state in baseball and basketball. He was called “Kick” at home, but “Casey,” thanks to his initials, was the nickname that stuck. The boy went to the University of Texas on an athletic scholarship. After his freshman year, he played in a summer baseball league in Florida in 1952 and decided to turn professional. He worked out for his father’s employer, the Boston Braves, at their Triple-A farm club in Milwaukee. He had an appointment with the White Sox, so Milwaukee infielder Gene Mauch offered him a ride to Chicago. Mauch’s brother-in-law, Roy Smalley, was the Cubs’ shortstop and arranged for Casey to try out with the team. The Cubs outbid the Braves with a reported bonus of $25,000. Even at 20, Wise was looking ahead. He told the Cubs he planned to complete his education and would not report until classes ended in the spring. After transferring to the University of Florida, he skipped spring training and the early weeks of the season for his first three years in the minors. Wise moved up quickly through the Cubs system. In his second season, at Class-A ball in Des Moines in 1953, he became a switch-hitter while suffering through a batting slump, and set a Western League record by handling 204 consecutive chances without an error. In January 1954 he married Joan Palda. He spent most of that year in Double-A at Beaumont, where he reeled off an 18-game hitting streak. With his Bachelor of Science degree in hand, Wise attended spring training for the first time in 1956. The Cubs clocked him from home to first in 3.8 seconds (any time under 4 seconds is well above average). He was a slender six-footer, with no power to match his speed. Sent to the top farm club in Los Angeles, he broke out as a stud prospect. The Angels were one of the most powerful minor league teams in history, dominating the Pacific Coast League with a 107-61 record. Wise played every game and batted .287/.332/.379 with 202 hits and 122 runs scored. He played shortstop because Gene Mauch was a fixture at second. He and Mauch made unlikely roommates, the 23-year-old college boy and the 30-year-old tobacco-chewing, chain-smoking minor league veteran who was already a manager in training. They spent many hours talking baseball. The Cubs finished last in 1956 and cleaned house, firing the general manager, manager, and all the coaches. Owner Philip Wrigley turned to the Pacific Coast League champions for help. Angels general manager John Holland and manager Bob Scheffing moved up to the big club, bringing 11 players with them. Wise was hitting .220/.281/.280 when he was benched after 21 games. “Let’s face it, I was lousy,” he said. “But I know I’m a better ballplayer than that, and it seemed like the Cubs lost confidence in me.”8 He was demoted to Triple-A at the end of June. After the season Chicago traded Wise to the Milwaukee Braves. Milwaukee papers treated it as a homecoming, since his father was still scouting for the club, but the Braves had perennial All-Star and future Hall of Famer Red Schoendienst at second base and two younger replacements, Felix Mantilla and Mel Roach, waiting for Schoendienst to wear out. Wise never started a game before he was sent down to Triple-A Wichita in May. Schoendienst suffered a variety of ailments during the season. When he broke a finger in July, Wise was recalled. Soon afterward the Giants’ Daryl Spencer’s hard slide sent Roach to a hospital for knee surgery. Wise filled in at second and short for the rest of the season as the Braves won their second straight pennant. Wise got one at-bat in the 1958 World Series against the Yankees, as a pinch-hitter in the ninth inning of Game Three at Yankee Stadium. With Milwaukee down 4-0, his job was to get on base. The pitcher was a familiar face, Ryne Duren. Duren missed with his first two pitches, and Wise was ordered to take the next two, both strikes. “I had one swing and, of course, I struck out,” he said.9 He pinch-ran in the fifth game, then watched as New York won the championship in seven. A month after the Series, Schoendienst was diagnosed with tuberculosis. Doctors said he would miss all of the 1959 season. The Braves, casting about for a second baseman, tried to trade for the Dodgers’ Jim Gilliam and Cincinnati’s Johnny Temple, but came up empty. Schoendienst’s heir apparent, Mel Roach, had not yet recovered from his knee operation. When spring training opened, manager Fred Haney said, “Everyone, including me, wants to know who’s going to play second.”10 Somebody pointed out that Hank Aaron had started his career as a second baseman, but Aaron quickly put a stop to that talk. Haney listed Wise among five candidates, but he never played the position all spring. He opened the season at Triple-A Louisville while the Braves tried out four second basemen. Felix Mantilla, Chuck Cottier, Johnny O'Brien, and Joe Morgan (the future Red Sox manager) hit a combined .172 in the first 45 games. As with the Cubs, Wise didn’t get much of a chance. He went 4-for-8 in his first two games and hit his first major league home run on June 11, batting right-handed against the Cardinals’ Vinegar Bend Mizell. But after 18 games his average had sunk to .171. Haney, fighting the Giants for first place, pulled the plug. He put Mantilla back at second. On July 4 Wise pinch-ran in the eighth inning against Philadelphia, carrying the tying run at first base. When Bill Bruton banged a liner to left, Wise rounded second and stopped. He retreated to the bag just as Bruton slid in from the other direction. The Phillies’ George Freese tagged both of them. Bruton was out, since Wise was the rightful occupant of the base, but Wise stepped off and Freese tagged him again — this time for keeps. Bruton had singled into a double play. The Braves lost, 2-1. Haney was so mad he couldn’t speak. The next day he called Wise’s brain cramp inexcusable. “It wasn’t major league,” he fumed. “In fact, it wasn’t even minor league.”12 Wise was booted back to Louisville, probably to save his manager from a murder charge. Haney went on to use three more second basemen — Roach, Bobby Avila, and Schoendienst, for a few token innings in September. Combined, the eight of them hit .213/.289/.279. Milwaukee finished in a first-place tie with Los Angeles and lost the pennant in a playoff. Even a halfway-decent second baseman surely would have been good for at least one more win. Wise never got another chance with the Braves. They traded him to Detroit after the season. It was one moment of glory among many disappointments. In July Wise was batting .147 when he was sent down to Triple-A Denver to make room for Ozzie Virgil, the Tigers’ first black player and the majors’ first Dominican. Though he was just 28, Wise was pigeonholed as a utility player or, worse, a Triple-A player. With a wife and two children to support and a college degree, he would not be a baseball lifer like his father. He decided to become a dentist, but needed additional college credits to qualify for dental school because his undergraduate degree was in mechanical engineering. He left baseball to prepare for the rest of his life. After a year off, Wise went back to the game in 1962 with the Triple-A Jacksonville Suns. Although the reason for his about-face is not known, Jacksonville was just a few hours away from his home in St. Petersburg, and he may have wanted to play again for manager Ben Geraghty, who had been his manager at Wichita. He joined the team late, after spring classes ended. He returned in 1963 and took over as manager in June when Geraghty died suddenly of a heart attack. The last Owl was a 53-footer that he berthed outside his and Joan’s retirement condo. Their children, daughter Kendra and son Kendall, a urologist, lived nearby. Wise died at 74 on February 20, 2007, of complications from heart surgery. Wise’s four seasons in the majors were a rollercoaster ride. He was demoted to Triple A every year, and his two trials as an everyday player were cut short when he failed to hit right away. The turbulence left a mark. Obituary, Naples (Florida) Daily News, GenealogyBank.com. http://genealogybank.com/doc/obituaries/obit/11776B75E33248D0-11776B75E3..., accessed September 5, 2016. Wise, Kendall, M.D., the player’s son. Telephone interview, September 16, 2016. 1 James S. Hirsch, Willie Mays: The Life, The Legend (New York: Scribner, 2010), 58. 2 “Casey Should Be a Brave,” Associated Press story (1957) in Wise’s file at the National Baseball Hall of Fame library, Cooperstown, New York. 4 Gaylon H. White, The Bilko Athletic Club: The Story of the 1956 Los Angeles Angels (Chicago: Rowman & Littlefield, 2014), 109. 7 Jerry Liska, “Banks and 8 Other Guys Give Cubs Same 1956 Look,” Chicago Tribune, April 14, 1957: K23. 8 “Wise Hopes to Stick With Braves and Be Ready if Chance Comes,” Milwaukee Journal, undated (1958) story, in HOF file. 9 White, “Casey at Bat,” http://www.bilkoathleticclub.com/blog/casey-at-bat/, accessed September 8, 2016. 10 Ed Pollock, “Value of RBIs ‘Exaggerated,’ Says Haney,” The Sporting News, April 1, 1959: 10. 11 Oliver E. Kuechle, “Time Out for Talk,” Milwaukee Journal, June 2, 1959, in HOF file. 12 “Wise Started Return to Minors With a Single Step—Off Second,” Milwaukee Journal, July 6, 1959, in HOF file. 13 The Yankees hired Hughie Wise within a few weeks. He later scouted for the White Sox. 14 Dave Diles, “Bengals Blast Chisox 12-4,” Associated Press-Battle Creek (Michigan) Enquirer, April 25, 1960: 11. 15 Player questionnaire in HOF file.